After finding herself at the center of a scandal in her small Ohio town of Zenith, seventeen-year-old Evie O’Neill is shipped off to New York City to live with her Uncle Will. Evie doesn’t mind in the least because this is her chance to make a name for herself amidst the bright lights of the Big Apple. When her uncle, the curator of The Museum of American Folklore, Superstition, and the Occult, is called in to assist the police with a murder investigation, Evie jumps at the chance to get both the museum and her name in the papers. She’s about to discover that the secret talent that got her exiled from Zenith could prove extremely useful in tracking down what turns out to be a serial killer. Evie believes that she’s the only one hiding a supernatural gift, but whether she realizes it or not, she’ll soon cross paths with several others who can do extraordinary things, too. What a fantastic read The Diviners was! 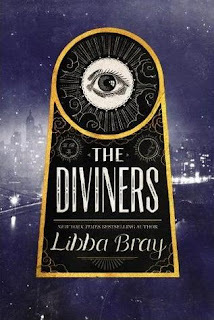 I’d never read any YA novels set during the Roaring Twenties before, or any books by Libba Bray for that matter, and this was one unique novel. The setting, the characters, and the paranormal element were all so fresh, and together they formed a mesmerizing read that I couldn’t put down, even in the middle of the night when I got pretty creeped out. I wasn’t all that fond of Evie at first. I found her immature, selfish, and annoyingly self-promoting. All she could think about upon her arrival in New York was how to become a household name. At first it’s potential fame that drives Evie’s interest in her Uncle Will’s consultations with the New York police regarding a string of murders that appear to be ritualistic. As Evie becomes more and more involved with the case and witnesses some truly appalling sights, though, her focus shifts from seeking celebrity to stopping a killer. She grows up quite a bit over the course of the novel, and by the end, I liked her a lot. The Diviners features a fairly long roster of characters in addition to Evie, all with their own richly detailed stories to tell. There’s Memphis Campbell, a numbers runner whose healing ability disappeared after he failed to save his dying mother; Theta Knight, a Ziegfeld Girl with even more stars in her eyes than Evie has; and Jericho Jones, Uncle Will’s quiet assistant who’s concealing a big secret of his own. These are only a few of the characters we meet, and the way in which Bray gives each one of them a distinct narrative voice is very impressive. My only quibble with the multiple story lines is that they do take a while to converge, and even by the end of the book, not all of them do. I suspect that there’ll be plenty of time for that in future books, especially if they equal the page count of The Diviners. This is one of the scariest books I’ve ever read. I’m already faint of heart when it comes to the horror stuff, and the murders in The Diviners are described in rather gruesome detail. The motivation behind them is also frightening in its own way. After the shock of the first killing, I read with a constant sense of unease because I never knew when the ominous whistling that signaled the approach of Naughty John was going to start. One minute, everybody is happy and dancing it up at the Hotsy Totsy club (coolest name ever!). The next, some poor, lone soul is being stalked, unaware of what’s about to happen. Then the whistling begins. I never knew that whistling could be so terrifying! Holding my interest for nearly 600 pages isn't easy, but The Diviners did exactly that. I loved reading about life in 1920’s New York City and was thrilled to see the Brooklyn neighborhood that I grew up in mentioned specifically. Toss in an inventive twist on the paranormal, and this is a knockout read that is most definitely worth the time investment. 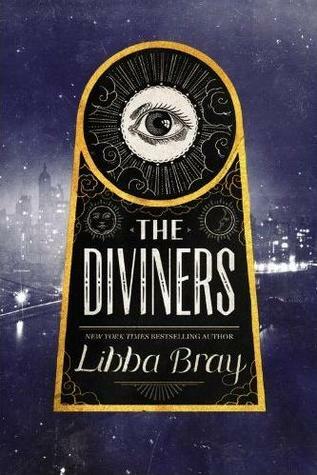 The Diviners is so different from the other paranormal books that I’ve read, and in a good way. I never imagined the Roaring Twenties and the supernatural mixing together in such perfect harmony, but that just goes to show you how limited my imagination is. Libba Bray’s creativity is nothing short of brilliant here, and I cannot wait to read the next book in this series. Great review. I have heard great things about the book & I can't wait to read it for myself. I need to read more paranormal. I love paranormal books, and this one is certainly a standout among the ones I've read. I hope you enjoy it, too! I can't wait for the sequel to this. It was such a fresh take on the paranormal genre! I didn't realize how creepy this was myself until I began reading it. It gave me the absolute chills at times! I hope you have the chance to read it soon! I am a bit in love with the 1920's so I keep thinking I need to read this one! Great review and you sold me on it! If you love the 20's, then you'll probably love this! The lingo that's used in the book is just fantastic. We wanted to do something special for the release of Clockwork Princess, so we decided to go Victorian steampunk with the blog for a little while. We also couldn't resist the chance to put ourselves in the header image with Will and Jem! I also love it when I start out really disliking a character, and then that character completely reverses my opinion by the end of the book. The Diviners gets very dark at times, which I wasn't expecting but loved all the same! Ok first of all, I am loving the blog revamp! It reminds me of the Infernal Devices a little bit and it's just making me want to start reading those books NOW!! Secondly, brilliant review :D I'm quite faint-hearted too and I didn't even realize this was such a scary read! Reading your review made me want to read it all the more though! I love how you described the intensity and the character evolution. And the time period is very appealing to me. Can't wait to check this one out! It's the perfect time to start reading The Infernal Devices! I'm rereading Clockwork Prince at the moment so that I'm ready for Clockwork Princess next week. Like the nerds we are, we wanted to celebrate its release. In addition to tweaking the blog design, we're going to have some TID-related posts next week. "Intense" is a good way to describe The Diviners. You have the glamour of the 20's mixed in with the paranormal. I highly recommend reading it! I love love the blog redesign. Anything with cats wins me over every time. I like that you still have your book people too. I'm not sure, what do you call your book people? You know, this review reminds me why Libba Bray and I can never become book soul mates. I don't know what it is, but none of her books ever capture my interest, and that's pretty amazing considering you guys reviewed it and I usually want to read 99% of everything you review. I believe she was also one of the authors I met last year at this book convention I went too. She was a genuinely nice person. It's just that me and Libba's books never can connect. We've never thought up a special name for them, so we just call them book people, too. Sorry to hear that her books aren't your cup of tea. I've had a rather rocky road with John Green's novels. While I do think that he's a very talented writer, there's something about his style that just doesn't work for me. My cousins, who adore him, of course think I'm insane. I definitely need to check out this book that combines the paranormal and the roaring twenties. I love the past and everything exciting. I'm glad that such a large book could keep your attention as I always fear I will never make it through. SO hopefully this will be a big book to break my curse. I think reading the first four A Song of Ice and Fire books in a row helped train me to tackle big novels, lol. The Diviners does have a few parts that could have been pared down, but on the whole, the story moved at a good pace. I never felt like I needed to put the book aside for a break. I hope this tome proves to be the curse breaker! I was so freaked out by the scary parts that I had to keep reading, despite it usually being around 1 a.m., until I could leave the book in a non-scary place before going to sleep. Jericho was a fascinating character; I hope he gets a lot more page time in the next book. I really enjoyed Bray's Gemma Doyle trilogy (which you should read if you get a chance, by the way). And from poking around, it really seems that The Diviners is even better than those books. The multiple perspective thing might bother me, depending on how the author handles it, but still. It sounds fantastic! I definitely plan to read Gemma Doyle! I've been keeping an eye out for A Great and Terrible Beauty at the library the last few times I've gone, but it hasn't come back in yet. I'm quite eager to read it because I was really impressed with The Diviners.